I'd be interested in seeing a similar graph for the Peruvian sol. @Craig: If you have a good source of historical data for the PEN, I’d be happy to create a chart for you. The sources I’ve checked would require a lot of hand work to assemble the data set, but I can see that the PEN has been closely tied to the USD (staying between about 2.5 and 3 over the last 5 years), so the shape of it’s chart won’t be that different from the USD chart for that period. 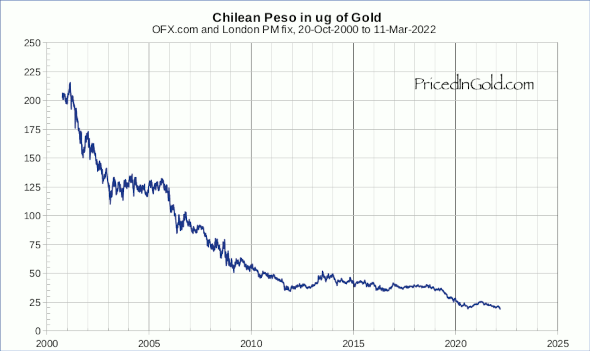 this will happen to the USD if we continue to allow the Government to continue on it's present monetary course. 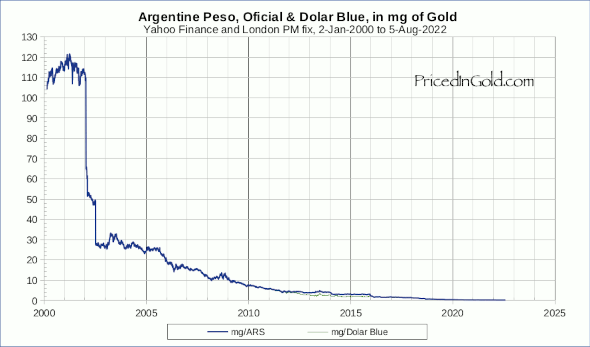 Sir, would you mind if I use your charts to make a comparision between dollar and argentina peso value for an image I would upload on facebook and/or twitter? I intend to write the source of the charts on the image, if you agree on that too. Hi Agustin, That would be fine. 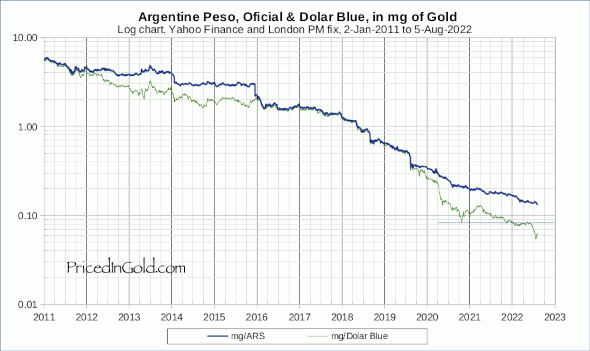 Note that the informal value of the ARS for the last two days have set new all time lows, closing the week at 2.143 mg, 3.1% below the old low of 2.211 mg set on 20-Mar-13. Please send me a link to your page! You can extract what you want. Or at the URL I gave above there is a speadsheet with all the daily informal buy/sell rates from 96 to present. The Banco Central de Reserval del Peru tries to keep the exchange rate "stable." However, in recent years, in spite of buying enormous quantities of dollars, it hasn't been able to keep the dollar from steadily falling against the sol. I expect that to continue, and eventually to accelerate as the the BCRP gives up. @Craig: Thanks for the link! I’ve created a page for the Nuevo Sol, showing prices in mg daily from 1997 and 2009. Since the low in 2011, the PEN has run from 6 mg to about 8.5 mg as of 1-Aug-2013. Interesting inforgraphic for Argentina and Chile. Do you have statistic for Canada? 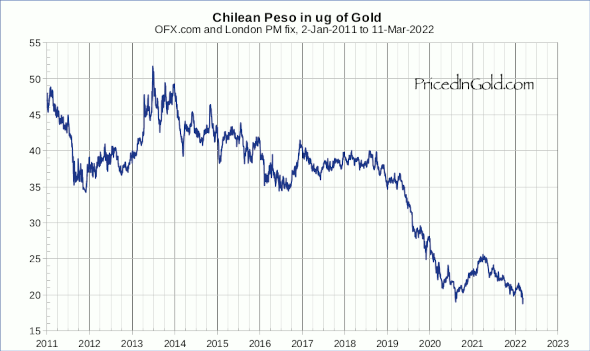 Editor – Did you intend to use the "Microgram" symbol versus the "Milligram" on the Chile Peso chart, while you use "Milligram" on the Argentina Peso, USD chart, and most other charts? This could be updated to the current date. @malthus: Thanks for the reminder. These were dropped when I had a system crash. I will look into updating them! @malthus: ARS and CLP now getting regular updates!